Our wedding ceremony was held at St. Ann Catholic Church in Normandy, MO. St. Ann is located just down the street from the University of Missouri-St. Louis (UMSL), where both Jenny and Tom went to college. Fr. Bill Kempf officiated the ceremony. Fr. Bill is the director of the Catholic Newman Center at UMSL and also the pastor of St. Ann. Music was provided by Christian Cosas, Lesley and Dave Oswald, Ginny Booker and Nancy Daniel. Our wedding reception was held at the Holiday Inn in Earth City, MO (formerly the Four Points Sheraton - they changed the name of the hotel two days before the wedding!). There were hors d'ouevres, drinks, dinner, cake and dancing. We spent 8 days, 7 nights in Jamaica at the Sandals Grande Ocho Rios Beach and Villa Resort. We stayed in a one bedroom suite with a balcony over looking our pool shared with only 3 other couples. We climbed the Dunn's River Falls, took a glass bottom boat ride and swam a lot. Melissa is a physics major at the University of Missouri-St. Louis. 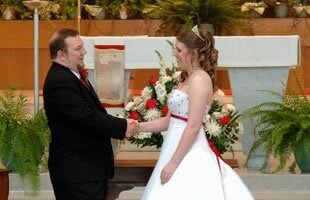 She and Jenny met through the co-ed service fraternity, Alpha Phi Omega. In her free time, Melissa enjoys reading, spending time with her baby niece Mikayla, and working at Save-A-Lot grocery store. A native of Hazelwood, MO, Gary met Tom at the Pierre Laclede Honors College at the University of Missouri-St. Louis, while playing cards between classes. Gary enjoys science and working with expensive, high-performance computing clusters, which he does for a living at Fermi National Accelerator Laboratory. He remains a loyal Cardinals fan, even though he currently lives among Cubs fans in Chicago. Gary relaxes by watching Family Guy and The Simpsons, and quoting rap lyrics. He and his wife, Debbie, have a one year old daughter, Abby. Gary's answer to the "traditonal St. Louis question" is McCluer High School. Besides being Jenny's sister, Cassy is a junior majoring in fashion design at Stephens College in Columbia, MO. Cassy enjoys fashion design, interior design, sewing, journaling, hanging out with friends, going to Mizzou games, and going to the zoo. She works at Hardees and at a research lab at Mizzou. Steve and Tom also met in 8th grade algebra, and were good friends throughout high school and after. Steve enjoys working out, the Three Stooges, and playing guitar, and misses a lot of sleep playing "World of Warcraft." A graduate of Truman State University, he and Mike are collaborating on starting up their own company. Steve got married to his wife Amy in March. He secretly misses Vanilla Ice. Jen just graduated from the University of Missouri-St. Louis, majoring in International Business with an emphasis in Management, and minoring in Spanish (she's almost fluent). She and Jenny met when they pledged together in the coed service fraternity of Alpha Phi Omega in the fall of 2003. Jen loves to swim, listen to latin/salsa music, dance, work out, and cheer on the St. Louis Cardinals like crazy! Tom and Jeremy first met in high school over an issue of Road & Track magazine, and have been good friends ever since. His hobbies include cooking, martial arts (jujitsu and kickboxing), philosophy, old BMW automobiles and motorcycles, and watching The Simpsons on DVD while drinking Fat Tire beer. Jeremy is currently working on his doctorate in chemistry at the University of Georgia. He owns two adopted cats and is also the only groomsmen to have lived in two foreign countries: Australia and Los Angeles. Elizabeth graduated from St. Louis University in 2004 with degrees in communication and political journalism. She is currently attending St. Louis Community College working on an associates degree in photography with hopes of going to graduate school in photo journalism someday. Liz and Jenny met through Alpha Phi Omega. She works at the YMCA as a Special Events-Marketing Coordinator, and has an adorable one year old son named Andrew. Mike first met Tom in 8th grade algebra, and has been one of his best friends ever since. After graduating from Truman State University, Mike was Tom's roommate and fellow homicide witness (true story!). He is a programming consultant, investor, and budding entrepeneur, but also finds time for his hobbies of woodworking and baseball. Mike and his wife, Colleen, live about a mile from Tom and Jenny in neighboring Manchester, MO. Mike has never lost a set of tennis to Tom. Angie is working on her second degree at the University of Missouri-St. Louis, this time majoring in education. She enjoys reading, teaching kids, swimming, chillin' with friends and sleeping (who doesn't). She spends a lot of her time at the Catholic Newman Center which is where she and Jenny met. John, Jenny's younger brother, is a junior at Hickman High School in Columbia, MO, where he makes a lot of noise playing drums in the marching band. Outside of school, John is an avid fan of college sports (especially football and basketball) and also a video game junkie. Carrie used to work with Jenny at infūz, but recently accepted a job as a high school history teacher and cheerleading coach. Carrie attended the University of Missouri-St. Louis, and majored in history and secondary education. In her free time, Carrie enjoys reading, researching Saint Louis history, walking and working on her house. Michael and Tom previously worked together at a local cable TV megacorporation. A music lover, he has played drums with various bands around town, and also DJs. When not cranking out beats, he rides motorcycles and enjoys his collection of cars, including a 2003 350Z, to which he practices speaking Japanese. Michael lives in Pasadena Hills with his girlfriend, Reina. Trivia fact: Michael attended St. Ann's grade school before going to CBC and SLU.